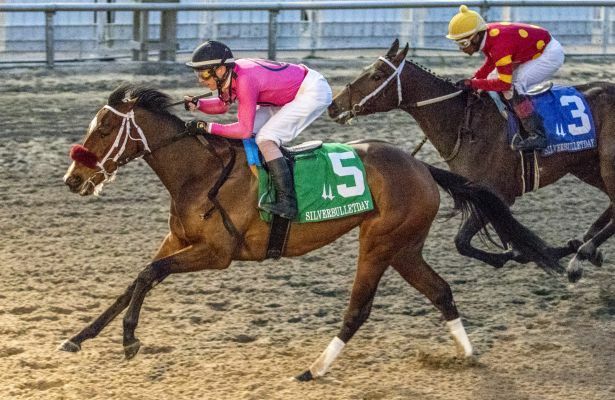 points toward the 2019 Kentucky Oaks on May 3 at Churchill Downs. O’Dwyer said he will speak with the owners, but would like to aim for the Rachel Alexandra Stakes (G2) Feb. 16 at Fair Grounds. Barber, Wachtel Stable and Madaket Stables LLC to jump on board. Jockey Joe Rocco Jr. was aboard for both the Silverbulletday and the Churchill Downs win. front. Despite the easy pace, the leaders did not last down the stretch. ease. She completed the 1 mile and 70 yards in 1:45.34. Eres Tu came on for second three-quarters of a length behind the winner. The favorite Grandaria was third over Liora.